1 Conclusion Kenneth Moreland Sandia National Laboratories Sandia is a multiprogram laboratory operated by Sandia Corporation, a Lockheed Martin Company, for the United States Department of Energys National Nuclear Security Administration under contract DE-AC04-94AL85000. 2 Please Provide Feedback Did you enjoy the format? Should we continue next year (with a new set of topics)? Anything new you would like to see? Anything you would like to see in more detail? 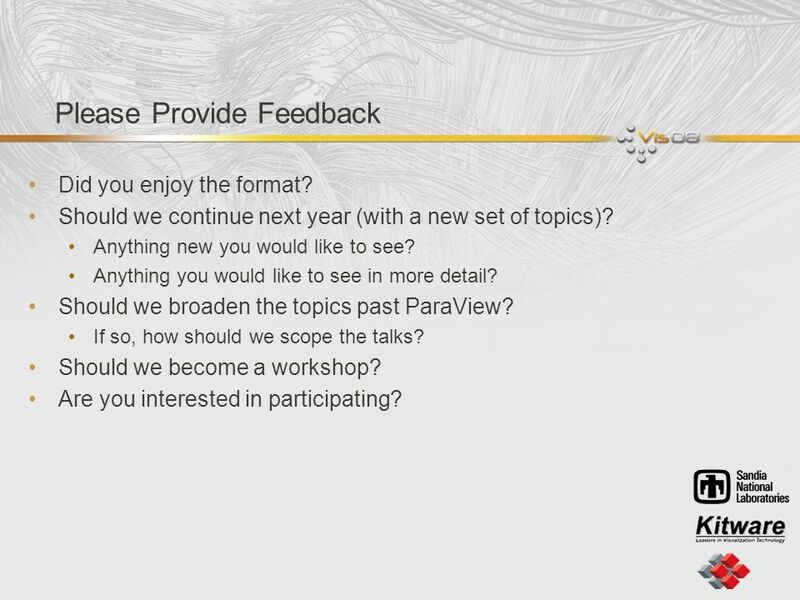 Should we broaden the topics past ParaView? If so, how should we scope the talks? Should we become a workshop? Are you interested in participating? 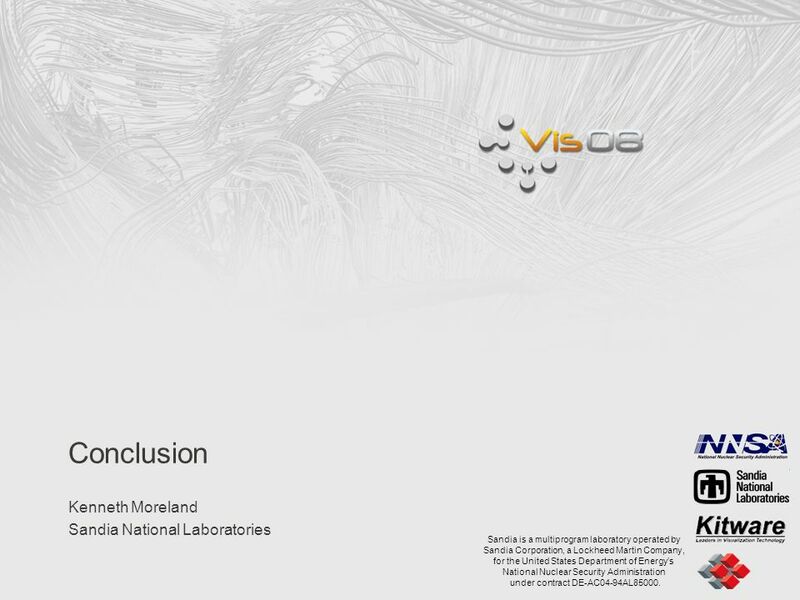 Download ppt "Conclusion Kenneth Moreland Sandia National Laboratories Sandia is a multiprogram laboratory operated by Sandia Corporation, a Lockheed Martin Company,"
© Telelogic AB  Sandia is a multiprogram laboratory operated by Sandia Corporation, a Lockheed Martin Company for the United States Department of Energys. Sandia is a multiprogram laboratory operated by Sandia Corporation, a Lockheed Martin Company, for the United States Department of Energys National Nuclear. Advanced ParaView Visualization Kenneth Moreland, David Thompson, Timothy Shead Sandia National Laboratories Utkarsh Ayachit Kitware Inc. John Biddiscombe. Parallel Visualization Kenneth Moreland Sandia National Laboratories Sandia is a multiprogram laboratory operated by Sandia Corporation, a Lockheed Martin. Generation of Pareto Optimal Ensembles of Calibrated Parameter Sets for Climate Models Keith Dalbey, Ph.D. Sandia National Labs, Dept 1441, Optimization. Photos placed in horizontal position with even amount of white space between photos and header Sandia National Laboratories is a multi-program laboratory. Sandia is a multiprogram laboratory operated by Sandia Corporation, a Lockheed Martin Company, for the United States Department of Energy’s National Nuclear. Unstructured Data Partitioning for Large Scale Visualization CSCAPES Workshop June, 2008 Kenneth Moreland Sandia National Laboratories Sandia is a multiprogram. Sandia is a multi-program laboratory operated by Sandia Corporation, a Lockheed Martin Company, for the United States Department of Energy’s National Nuclear. Mark A. Rumsey Wind Energy Technology Department Sandia National Laboratories Blade Sensors Sandia. Documentation Management Biosafety and Biosecurity Awareness Training For Afghan and Pakistani Bioscientists January 12-14, 2010 SAND No P Sandia. SAND Number: P Sandia is a multi-program laboratory operated by Sandia Corporation, a Lockheed Martin Company, for the United States Department.